by Jack M. Balkin. The Belknap Press of Harvard University Press, 2011. 480 pp. Cloth. $35. ISBN: 978-0-674-06178-1. 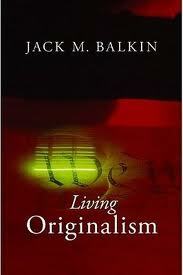 Jack Balkin’s Living Originalism is a brilliant exploration of the foundations of American constitutionalism. The book will undoubtedly find a well-deserved place on any short list of true constitutional-theory classics – alongside such canonical works as John Hart Ely’s Democracy and Distrust and Ronald Dworkin’s Law’s Empire. As the title Living Originalism suggests, Balkin argues for what could be a called a “third way” in American constitutionalism, a fusion of competing originalist and living-constitutionalist methodologies. Properly understood, Balkin contends, originalism and living constitutionalism are not in fact rivals but rather necessary complements within the overarching enterprise of American constitutional interpretation. Balkin’s theory has several key components. He first argues that the choice to accept the American constitutional project as one’s own project has necessary consequences for the selection of interpretive methods: “Treating the Constitution as our law today means that we adopt its plan for governance as our plan for governance and that we implement and build on it in ways that are consistent with the plan” (p.36). The Constitution, as written law, establishes a basic framework of government which “sets politics in motion” and simultaneously "constrains and enables” later decision-making (pp.3, 35). If we wish to maintain the Constitution as our plan for government, with its “distinctive forms of constraint and delegation,” then we must use interpretive methods that “preserve the meaning of the words that constitute the framework” and allow the Constitution to function as written law (pp.35-36). However, the method of “text and principle” also encompasses living constitutionalism because fidelity to the original semantic meaning of the Constitution is in many cases completely consistent with evolving living-constitutionalist constructions of the text. Why is this so? Because the text of the Constitution is not confined to firm legal rules that maximize constraint; it also contains open-ended standards and principles that delegate power to future decision-makers. The distinction between the Constitution’s rules, on the one hand, and its standards and principles, on the other, is central to Balkin’s fusion of originalism and living constitutionalism. When the framers of a constitutional provision choose a firm textual rule (e.g., the president must be at least thirty-five), the original semantic meaning of the rule is clear, and true fidelity to the Constitution leaves little or no room for creative forms of living constitutionalism. “Thirty-five” means thirty-five. But, Balkin argues, when framers deliberately choose open-ended textual standards and principles (e.g., prohibiting “unreasonable” searches and seizures or laws abridging “freedom of speech”), the original semantic meaning is quite consistent with a broad range of later living-constitutionalist constructions which can change as values and conditions change. “Unreasonable” means unreasonable, a flexible standard, rather than a clear rule; and this kind of standard delegates to future interpreters the discretion to determine more precisely what the standard requires when applied in particular cases. For the Constitution to function as a plan for government that delegates and empowers as well as constrains, the original semantic meaning of open-ended standards and principles must be preserved as such. When particular cases are resolved under these open-ended provisions, the interpreter must engage in the construction of the living Constitution, something each generation of Americans can do by drawing on additional interpretive strategies. These include the wide range of interpretive modes generally accepted as legitimate in the American legal community, such as arguments based on precedent, legal tradition, narrower forms of originalism (e.g., the framers’ “expected applications”), and constitutional purposes and policies. Balkin also contends that a wide range of political and social movements are engaged in the process of constitutional construction when they act to influence social and cultural values in ways that will eventually change the shape given to constitutional principles by elected officials and judges. The civil rights movement, the feminist movement, the gay rights movement – all are participants in the process of constitutional construction and not just when they are litigating cases or expressly arguing about the Constitution. In fact, Balkin’s conception of the sweep of the living Constitution is so expansive that it is hard to cabin – and he concludes that “it is best not to worry too much about where constitutional construction leaves off and merely ordinary politics begins” (p.300). Significantly, Balkin also places ordinary citizens, rather than judges, at the center of American constitutionalism. On the crucial question of constitutional interpretation, Balkin contends that we “should start with interpretation by citizens as the standard case” and that “interpretation by judges [is] a special case with special considerations created by the judicial role” (p.17). In Balkin’s view, living constitutionalism cannot be primarily a theory about “what judges should do” because such a judge-centered view is at “odds with the very assumptions behind the living Constitution” (p.278). In fact, Balkin argues that the “social change” which makes the living Constitution “live” arises not from the judicial process but from much broader and deeper “social, political, and economic forces” which are consistent with the primacy of the democratic process in the United States and the popular sovereignty foundations of the Constitution (p.278). On the related question of interpretive authority, Balkin also “specifically reject[s]” the Supreme Court’s assertion of “judicial supremacy” in constitutional interpretation and notes that his book “assume[s] rather than argue[s]” for the benefits of a more limited power of judicial review (p.68). Most fundamentally, the construction of the living Constitution occurs in the realm of politics, and this provides the basis for Balkin’s claim about the relationship of living constitutionalism [*61] to the success of the American constitutional project. American values and social conditions change over time, and each generation of Americans further disagrees about many fundamental political questions. Through the process of living constitutionalism, Americans can respond to change and express their disagreements in ways that make it possible for them to fully accept rather than reject the Constitution as a continuing framework for government. Perennial and robust democratic debate about questions of liberty, fairness, justice, order, and prudence structured by constitutional principles preserves the Constitution’s legitimacy by enabling citizens over time to view the Constitution as a “common object of fidelity and attachment” whatever their political values (p.93). Building on this thought, Balkin contends that “normative theories” of constitutional interpretation are “important” principally because they can help citizens and other participants in debate “understand and express claims” concerning the “legitimacy or illegitimacy” of their “current constitutional arrangements” and political practices (p.93). Thus the principal function of theories of constitutional interpretation is not to provide judges with determinate, constrained, or putatively “correct” answers to legalistic constitutional questions but rather to allow citizens to express their political values in the broad language of the Constitution. Balkin’s own method of “text and principle” is meant to serve precisely as a “platform for persuasion,” one which can be used by anyone to argue for a conception of the Constitution that reflects his or her own preferred principles and policies – rather than as a method that will provide detailed instructions to judges on the resolution of difficult constitutional cases (p.129). In fact, one of the great strengths of Balkin’s book is the capacity of his theory to provide a satisfying account in its own terms of its most obvious interpretive rivals: the cluster of narrower “originalist” theories that emerged as conservative responses to the controversial liberal ventures of the Warren Court in the 1960s. Balkin repeatedly claims that the forms of originalism associated with the late Robert Bork and with Justice Antonin Scalia can be better understood as an exercise in living constitutionalism drawing implicitly on the method of “text and principle.” On this view, the Borkian theorist starts with a concern for text-based constitutional principles of democratic accountability and federalism. The Borkian’s unacknowledged living-constitutionalist construction of these principles reflects conservative values of populism and states’ rights, favoring the power of elected legislatures over unelected courts and the power of the fifty states over the power of the federal government. Borkians then seek to preserve their understanding of these constitutional principles from the threat posed by assertive federal judges who may prefer to remove many policy questions – such as abortion, capital punishment, flag desecration, and the like – from the state and federal democratic processes. Not surprisingly, a book with the panoramic scope and “third way” mediating impulses of Living Originalism will trouble as well as persuade. Progressive living constitutionalists, while recognizing Balkin as one of their own, may worry that the originalism at the foundation of his theory smuggles a potentially conservative ticking time-bomb into liberal constitutional theory. They may also be concerned that Balkin’s argument will inevitably confer further legitimacy on originalism as an interpretive method and thus on conservative theories of the Constitution more broadly. Conservative originalists are unlikely to mistake Balkin for a conservative or a close fellow traveler. They may worry that Balkin’s theory is meant to provide a mere originalist fig leaf for an otherwise very naked form of progressive living constitutionalism. They may further doubt whether the ready translation of political arguments into constitutional claims will support rather than erode constitutional legitimacy as winners and losers inevitably emerge and a Constitution potentially “neutral” on many issues becomes instead closely identified with controversial policies. Proponents of expansive judicial power more generally may worry that Balkin’s brand of constitutional populism – which places the citizen rather than the judge at the center of constitutional interpretation – combined with his rejection of judicial supremacy could ultimately encourage judicial passivity in the face of majoritarian political forces. Proponents of more limited judicial power will likely view Balkin as an enabler, if not a defender, of expansive judicial power – someone seemingly not unsatisfied with the energetic judicial invalidation of legislation that has become so commonplace over the last century in the [*63] face of routine political acquiescence. Some of them may also wonder whether Balkin’s stated “citizen-interpreter” focus will function to distract from (or otherwise provide cover for) energetic judicial living constitutionalism. Finally, some constitutional theorists may question Balkin’s expansive conception of the realm of the living Constitution. These theorists may prefer a more legalistic conception of the living Constitution, one which leaves a clearer and broader expanse of non-constitutional space in which the play of politics occurs as politics, to Balkin’s view, a “super-skyscraper” conception, which seeks to incorporate a seemingly vast array of legislative and political activity (e.g., passage of the Social Security Act) under the rubric of the living Constitution. This wide range of potential disagreement, however, is really a tribute to the author’s independence, originality, and depth. Balkin has written a compelling classic – powerful, rich, lucid, and incisive. Every American constitutional theorist will need to read – and contend with – Living Originalism’s sweeping and magisterial account of our constitutional project. That will no doubt be both a duty and a pleasure. Dworkin, Ronald. 1986. Law's Empire. Cambridge, MA: Harvard University Press. Ely, John Hart. 1980. Democracy and Distrust: A Theory of Judicial Review. Cambridge, MA: Harvard University Press. Copyright 2013 by the author, Jack Wade Nowlin.